Can you believe that we are less than two weeks away from the Fourth of July?! To me that holiday really signifies Summer & I love the patriotic spirit that everyone seems to catch around this time of year. 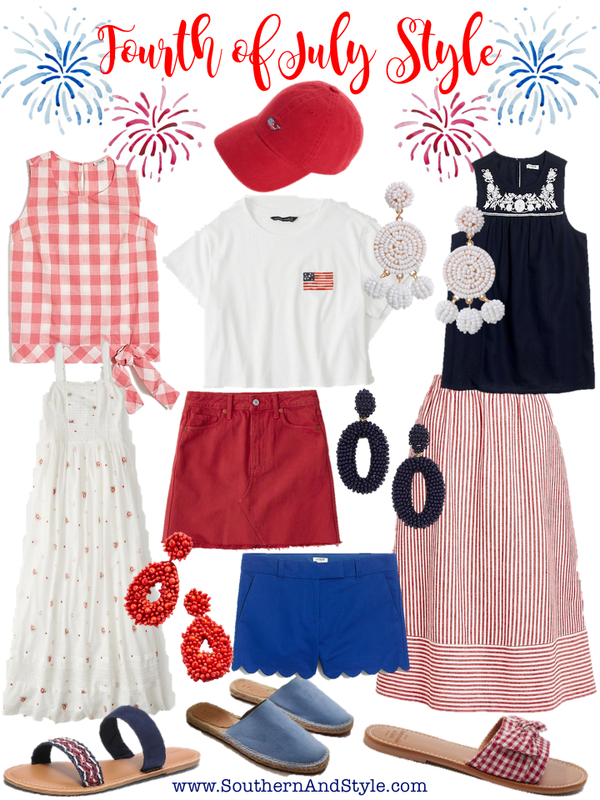 I picked out a few different patriotic pieces for y'all, these would work from everything to an afternoon spent on the lake to a beachside bar-be-cue or anything in between. Just a little note; those precious red & white gingham slides in the bottom right hand corner aren't to be missed. They're less than $40, they seem very well-made (they aren't your standard rubber slides-they're more of a leather-like material), and they come in 6 colors including a navy and white gingham, blue seersucker, and more neutrals as well. As for my Fourth of July, I'll probably be sporting these shorts, these shoes (not the cutest, but totally comfortable & perfect for water! ), and a cute patriotic top or tank by this brand since I'll hopefully be out on the lake with some of our good friends! Let me know below; do you dress up for the holiday or keep it casual?